Please refer to our stock # B17 when inquiring. 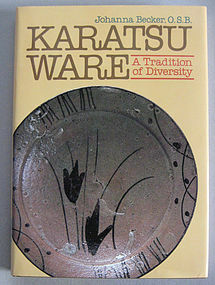 "Karatsu Ware: A Tradition of Diversity" by Johanna Becker, O.S.B. 1986 First Edition, Kodansha. Clothbound Hard Cover with original dust cover. Condition - New. 220 pages57 color and 179 B/W plates, illustrations, map, kiln list, and glossary. "Here, for the first time in English, a noted scholars examines this famous and important pottery and its tradition, throwing light on the diversity of Karatsu forms and glaze effects. The author traces this pottery's history from the enigma of its origins to the appearance of Korean potters and the explosive florescence of pottery production in the early 16th Century. She details the effect and influence of the tea aesthetic, explores the confusing nomenclature associated with this ware that has accumulated in the Japanese tea and art history worlds, and discusses the production of major kilns and kiln groups. The 57 color and 179 B/W plates illustrate a wide selection of the finest examples of Karatsu ware from the world's major collections of this remarkable ware."